SMALL to medium enterprises (SMEs) in Bulawayo yesterday lobbied Government to facilitate distribution of more point of sale machines saying they were losing out on business due to cash shortages. peaking after a tour of small businesses in the city by the Parliamentary Portfolio Committee on Small to Medium Enterprises and Cooperative Development, SME representatives said they were inundated by clients who wanted to purchase goods using plastic money. “Most of our clients come here to purchase using plastic money and we do not have POS machines to do the transactions. We appeal to the relevant authorities to help us have those machines because this affects our business.Clients come here without cash and we lose a lot in the business,” said a woman identified as Miss Ncube who deals in furniture. Some complained over rentals, which they said were too high. The SME players said they were paying more for small spaces, which did not support growth of their businesses. “We are being charged $110 and this is too much for a small space like this. On top of it all there are no toilets, no collection of rubbish and this place is poorly maintained. “This actually means we are not gaining anything and it is not good for the business,” said another participant who identified himself as Mr Phiri. Earlier in her address committee chairperson, Ms Dorothy Mangami, said the purpose of the tour was to assess barriers to financial inclusion of SMEs and adoption of plastic money by SMEs. “We are here to ascertain barriers to the financial inclusion of SMEs, which includes how they access loans from banks and the use of the multiple-currency system, which includes bond notes and the issue of swipe machines,” she said. Ms Mangami urged SMEs to open bank accounts in order to access loans and be able to have POS machines to facilitate ease of transacting.She told Business Chronicle on the sidelines of the tour that some of the challenges being faced by SMEs can be channelled through the ministry.Ms Mangami said there was a need to facilitate space allocation to SMEs in the central business district (CBD) in order to market their products properly. “Some of the issues they purport to be challenges can be taken to the Ministry. 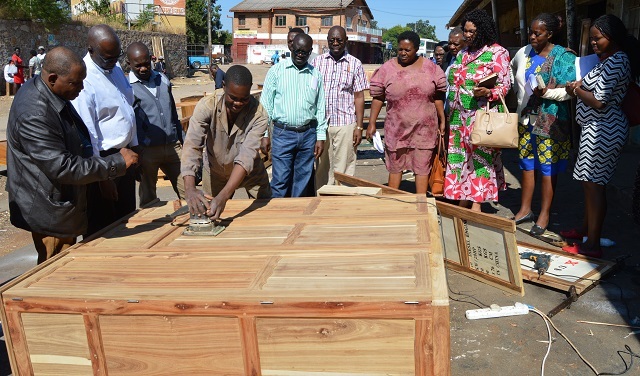 They can also find some store rooms in town to display their products because right now they are in the outskirts of CBDs where most people do not go,” she said.Ms Mangami said SMEs should come up with sound business pitches and adhere to prudent management standards so as to access finance. Last week, the Government launched a $90 million SMEs finance package to capacitate small businesses that are increasingly becoming a key economic pillar.The committee also visited small to medium enterprises that operate at Kelvin industrial site.